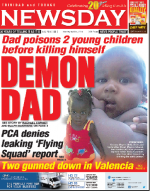 Published on April 14, 2014 in Crime in T&T, General T&T, Media and Violence. 2 Comments Tags: Abuse, Crime in T&T, murder, Newsday. SENIOR Forensic Pathologist Dr Valery Alexandrov yesterday revealed that Keanna Mayers and her brother Omari, were strangled and not poisoned as was initially thought. Alexandrov came to this conclusion after autopsies were done at the Forensic Science Centre St James. In a brief interview, Alexandrov told Newsday “out of an abundance of caution”, he also sent tissue samples for a toxicology test to find out if poison was involved.